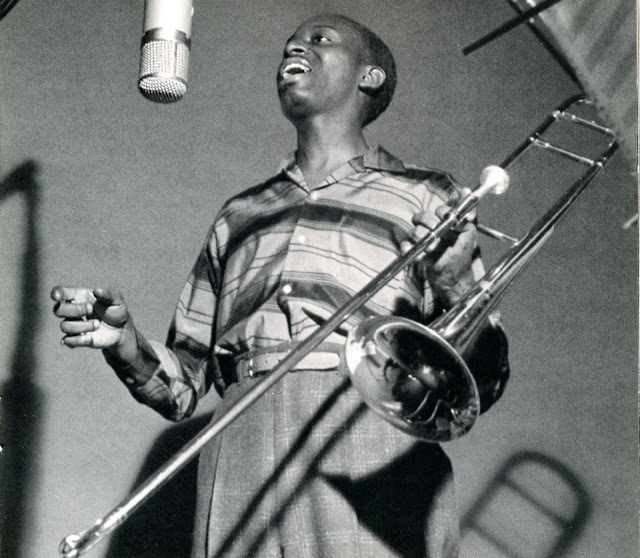 Gordon Jack “stopped by” the editorial offices of JazzProfiles recently and absolutely insisted that we take some time off from our efforts at maintaining the blog and generously offered this fine article about the late trombonist Bennie Green as a means of doing so. Gordon’s Bennie Green feature first appeared in the February 2013 issue of JazzJournal. For order information, please go here. “I first heard the distinctive sound of Bennie Green’s trombone around 1960 in Dobell’s jazz record shop in London’s Charing Cross Road. I was buying a copy of ‘Kind Of Blue’ when one of the assistants started playing ‘Walkin’ And Talkin’ – Green’s latest Blue Note release with Eddy Williams and Gildo Mahones. His velvet sound and relaxed delivery was infectious and totally different to the bebop masters of the day like J.J. Johnson, Kai Winding, Jimmy Cleveland and Frank Rosolino. Bennie Green was born on April 16th. 1923 in Chicago and his family was a musical one. With his brother Elbert who later played tenor saxophone with Roy Eldridge he attended the famous DuSable High School whose musical director was the celebrated Walter Dyett. The list of famous musicians who studied with Dyett is a long one but includes Gene Ammons, Julian Priester, Wilbur Ware, Dinah Washington, Johnny Griffin, Richard Davis and Nat Cole who once said, “We learnt everything there – jazz, gospel and classical music from Bach to Rachmaninov.” In these early formative years Bennie’s acknowledged influences were Trummy Young, Lawrence Brown, J.C.Higginbotham, Tommy Dorsey and Bobby Byrne. Much later of course J.J.Johnson was added to the mix. Thanks to a recommendation from Budd Johnson, Bennie joined Earl Hines’s band in the summer of 1942 just as James Petrillo’s AFM announced a strike preventing union members from recording for major labels. This was a great pity because that particular edition of the band boasted Dizzy Gillespie, Benny Harris, Charlie Parker, Shadow Wilson and Sarah Vaughan among its members. ‘Bird’s Diary’ by Ken Vail shows a photograph of them at an Apollo Theatre engagement on the 23rd. April 1943. Sitting next to Bennie in the section is Gus Chappell and an ‘unknown’ trombone who I think might be Cliff Smalls who joined the band at the same time as Bennie on trombone and relief pianist. Cliff Smalls was a man of many talents. He played piano on Earl Bostic’s huge 1951 hit, Flamingo and often accompanied Green during the fifties as well as working with singers like Brook Benton, Ella Fitzgerald and ‘Smokey’ Robinson. A fine example of his work in a trio setting with Oliver Jackson and Leonard Gaskin can be heard on Caravan BB 935 recorded in 1978. Green became very friendly with Dizzy Gillespie often visiting him at the trumpeter’s house where Dizzy would accompany him on the piano. These sessions were invaluable insights into the new harmonic and rhythmic discoveries and Bennie later described them as “Going to school”. Drafted into the military he was discharged in 1946 and later that year he recorded with Charlie Ventura for the first time on a big band date playing Neal Hefti and Stanley Baum arrangements. Ventura whose big influence was Chu Berry is a somewhat forgotten figure now but he was a virtuoso on the tenor, baritone and bass saxophones. In the summer of 1948 Charlie Ventura invited Bennie to join the new group he was forming to be called ‘Bop For The People’. Roy Kral was responsible for many of the arrangements that cleverly blended the often wordless vocals of Jackie Cain and Kral himself with a front-line of Conte Candoli, ‘Boots’ Mussulli, Green and Ventura. With this high profile group making regular radio broadcasts and concert appearances Bennie’s reputation as a superior soloist was now established. Drummer Ed Shaughnessy told me that he became very friendly with the trombonist who was his room-mate when they were on the road with Ventura. One of Bennie’s many delightful characteristics when playing a blues for instance was to remain on one note –often the tonic - for a chorus or more while maintaining interest with numerous and very subtle rhythmic variations. Ed found this particularly inspiring and he used to call him ‘Mr. Rhythm Trombone’. He also told me how upset he was when the group once stopped at an Ohio diner for some hamburgers. Bennie had to remain in one of the cars because of his colour – which he did without complaining. Ed said he was a “Lovely man”. Ventura’s group was breaking attendance records at the Royal Roost and was voted the No.1 bebop group by the readers of Down Beat and Metronome magazines. They ultimately recorded no less than 61 titles (some on obscure labels) and their brilliant but quite outrageous interpretation of I’m Forever Blowing Bubbles became something of a commercial success. The leader disbanded a few months after their famous Pasadena concert in May 1949 where they shared the bill with Erroll Garner, Jimmy Witherspoon and Roy Eldridge. Later that year on the 24th. December Green was part of a ‘Stars Of Modern Jazz’ concert at Carnegie Hall compered by Symphony Sid with Sarah Vaughan and the Charlie Parker quintet as headliners. The show was broadcast by the Voice Of America and Bennie appeared with Miles Davis, Sonny Stitt, Serge Chaloff, Bud Powell, Curly Russell and Max Roach playing Move, Hot House and Ornithology. As far as I know this marked the only time the trombonist worked with Serge Chaloff. In 1950 he recorded four titles with Gene Ammons and a seven piece group featuring Sonny Stitt on baritone who sounds pretty sensational on the instrument – such a pity he didn’t record on it more often. The date included an amusing band vocal on Who Put The Sleeping Pills In Rip Van Winkle’s Coffee? proving there should always be a place for humour in jazz. Bennie has a typically smooth chorus on what was originally titled Gravy and credited to the infamous Richard Carpenter although it was actually written by Jimmy Mundy. This has been confirmed by Junior Mance who worked a lot with Ammons and was staying at Mundy’s house when he wrote and arranged Gravy for the tenor-man. It became better known as Walkin’ when Miles Davis recorded it in 1954 with Carpenter still shown as the composer. Just to add to the confusion, Miles with Cannonball Adderley and John Coltrane recorded his own Sid’s Ahead in 1958 which bears a strong resemblance to Gravy aka Walkin’. In 1952 Bennie recorded four titles with strings demonstrating elements of Jack Teagarden especially in his immaculate control of the upper register on Embraceable You and Stardust. In 1953 he recorded an extrovert, foot-tapping date for Decca with Cecil Payne and Frank Wess where they pulled out all the stops on a simple but very effective Blow Your Horn. It has elements of rhythm and blues with one of his favourite call and response devices and became quite a juke-box hit. Two years earlier in a session with Eddie Davis, ‘Big Nick’ Nicholas, Rudy Williams and Art Blakey he had explored similar ‘down home’ material on Tenor Sax Shuffle and Sugar Syrup which probably introduced him to a new audience but wasn’t as popular as Blow Your Horn. Rudy Williams who died a year later in a fishing boat accident and was better known for his alto and tenor work has some impressive baritone outings on Flowing River and Sugar Syrup. The success of Blow Your Horn allowed Bennie to start working and recording regularly with his own quintet performing a repertoire of standards, ballads and blues which appealed to both jazz and R’n’B fans. One man who often played with him at this time was Billy Root who I met a few years ago in Las Vegas. Billy was one of the ‘House Tenors’ at the Blue Note in Philadelphia along with John Coltrane and Buddy Savitt. The owner Jackie Fields booked visiting stars like J.J Johnson, Roy Eldridge, Miles Davis and Kenny Dorham to play with the local rhythm section and one of the tenors which was cheaper than bringing them from New York with their own groups. Bennie Green was a guest in 1953 and he invited Billy to go to New York with him to play in a big band backing Ella Fitzgerald at the Apollo Theatre. The band included Ernie Royal, Thad Jones, Earle Warren, Charlie Rouse, Gene Ammons, Sahib Shihab, John Lewis, Paul Chambers and Osie Johnson and later they moved onto the Royal Theatre, Baltimore and the Howard Theatre, Washington D.C. There is a picture of Bennie Green, Benny Harris, Charlie Rouse, Sahib Shihab and Gerry Mulligan with Charlie Parker at the Apollo Theatre Harlem in Chan Parker’s book, ‘To Bird With Love’. She gives no date for the performance but Ken Vail confirms the booking was for a 17-piece band accompanying Parker for one week commencing August 12th.1954. 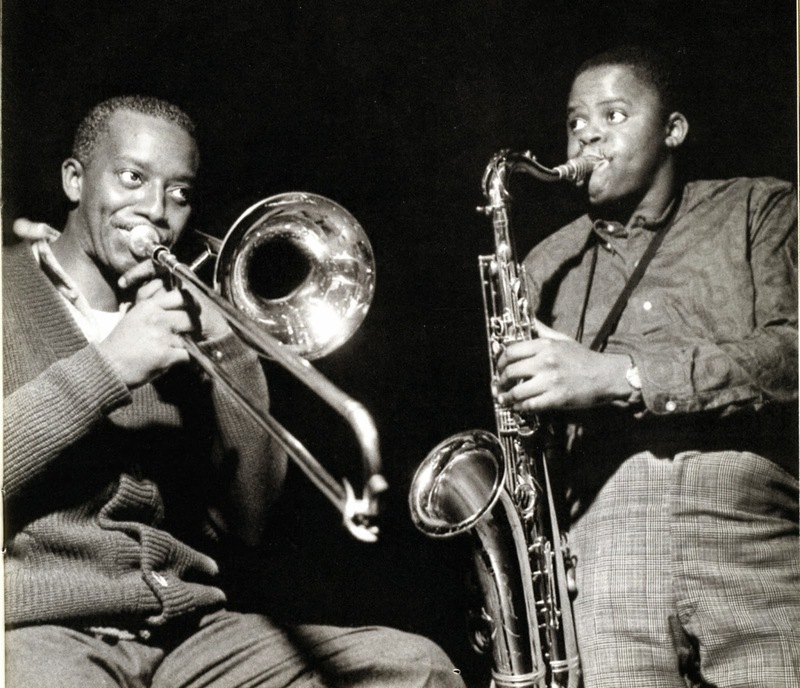 Later that month J.J.Johnson recorded his first two-trombone album with Kai Winding for Savoy Records although Bennie had apparently been Jay Jay’s first choice. He was busy so after Eddie Bert also turned him down, Jay Jay turned to Winding to form a group that had a life long after the initial recording session. 1954 was the year Green came fifth in Down Beat’s annual poll for ‘Best Trombone’ achieving 16% of the vote, his highest ever placing. The winner was Bill Harris. 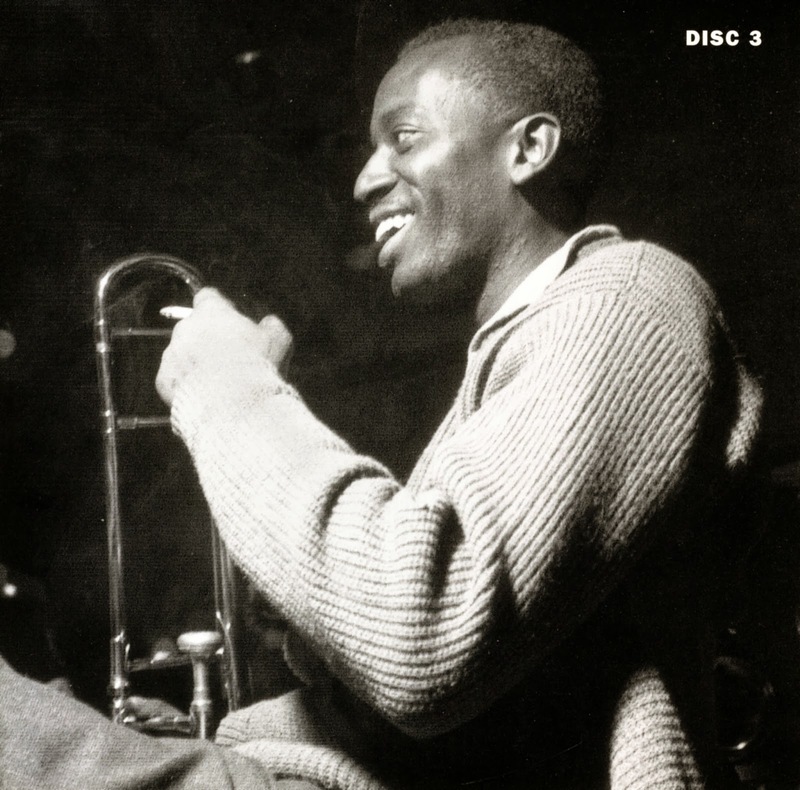 The following year in 1955 he recorded ‘Bennie Green Blows His Horn’ with Charlie Rouse together with the redoubtable Cliff Smalls and Candido in the rhythm section. Rouse sounds far more energised than he sometimes did later with Monk and the CD features one of the best recorded versions of Laura with a gem of a contribution from the pianist. He recorded ‘Walking Down’ with Eric Dixon in June 1956 but there is an unexplained gap in his activities during 1957. Writer and broadcaster Bob Porter has said, “He was off the scene” at that time which would seem to be confirmed by his next album in March 1958 titled - ‘Back On The Scene’. With Leonard Feather’s sleeve-note referring to his “Recent absence from the spotlight” the release obviously celebrated a return to the music business reuniting him with Charlie Rouse. Bennie was always an immaculate ballad performer with a beautifully controlled vibrato as he demonstrates on You’re Mine You and Melba’s Mood which is surely one of Melba Liston’s finest compositions. There is also a stunning version of Just Friends with the horns in fifths which was an unusual voicing for Bennie’s groups. Eight months after ‘Back On The Scene’ he recorded ‘Minor Revelation’ with the excellent Chicago-born tenor-man Eddy Williams, who was a hard-swinging member of the no-nonsense Dexter Gordon school. One of the titles – Encore - has the inimitable Babs Gonzales singing his own melody based on Illinois Jacquet’s Flying Home solo. In a clear reference to Green the lyric includes the line, “I’m glad that you’re back in town”. Just as an aside, there is a mystery concerning Eddy (aka Eddie) Willams. He recorded two albums with Green and one with Johnny Griffin but after his own ‘Makin’ Out’ LP in 1961 for Prestige he disappeared as a recording artist. In 1959 the trombonist recorded ‘Bennie Green Swings The Blues’ with Jimmy ‘Night Train’ Forrest and Sonny Clark. As the title implies the repertoire mostly consists of jazz music’s most basic harmony but with such gifted performers there is no chance of monotony. It does include though one of Bennie’s favourite standards – Pennies From heaven – which had been his feature with Charlie Ventura back in the forties. He only made one further LP as a leader in 1961 because the sixties was a difficult decade especially for his generation of jazz musicians. Clubs like Birdland were closing and the emergence of the Beatles and Rolling Stones reflected a definite change in popular music taste. The revolutionary concepts of the jazz avant-garde movement didn’t help matters either. He was still heard on the occasional recording and a 1964 date with Sonny Stitt as the leader was notable for an early jazz version of the lovely Our Day Will Come. It had been a big hit for Ruby And The Romantics the year before – their only one actually – and just like Ruby they perform it as a gentle bossa nova. George Benson’s appropriately titled ‘Cookbook’ CD from 1966 finds Green featured on two tracks with the giant of the baritone sax - Ronnie Cuber. Always a master of the blues his eight choruses here on that perennial jam session favourite Jumpin’ With Symphony Sid are quite outstanding. In 1968 and ’69 he was a member of Duke Ellington’s orchestra occasionally sitting in the section with one of his original inspirations, Lawrence Brown. They were two of as many as six trombones that Duke occasionally called on at this time the others being Buster Cooper, Chuck Connors, Benny Powell and Juilian Priester. One live date at Atlantic City’s Steel Pier - unfortunately not recorded - featured him singing and playing his speciality, I Wanna Blow. However when the band came to tour Europe towards the end of 1969 Duke was only using Brown and Connors with Norris Turney transposing third trombone parts on alto. In a recent posting to a jazz research site Dan Morgenstern speculated that Green, “Either failed to show or more likely had passport problems, maybe due to a prison record”. In the ‘70s he moved to Las Vegas and just like a number of other jazz musicians - Carl Fontana, Carson Smith, Bill Trujillo, Jack Montrose, Billy Root and Red Rodney etc. - he found work in the hotel bands there. After a long illness Bennie Green died of cancer on March 23rd. 1977. in San Diego. I would like to acknowledge the help received from John Bell, Mark Gardner, Bob Weir and Val Wilmer in researching Bennie Green’s career. Val interviewed him in 1967 for Jazz Monthly and remembers him as a very gentle, gentleman. Trombonist Bennie Green with Gene Ammons and Billy Root, tenor sax, Sonny Clark, piano, Ike Isaacs, bass and Elvin Jones, drums performing "We Wanna Cook Now" from SOUL STIRRIN'. Thanks for this insightful info. Very, very nice. An affectionate and respectful appreciation of one the THE great jazz trombonists of all time. I knew him and I loved him. His passing was a real shock to me. New York Voices Christmas CD - “Let It Snow"
GERRY MULLIGAN by Gordon Jack. GENE QUILL REMEMBERED - Gordon Jack.